LOS ANGELES -- An 8-year-old Jonathan Quick was perhaps the most nervous boy in Connecticut in June 1994, at home on his parents' couch watching Game 7 of the 1994 Stanley Cup Final between the New York Rangers and Vancouver Canucks. Quick's favorite player was goaltender Mike Richter, who carried the Rangers to their first championship in 54 years on the strength of the best regular season of his career that he managed to improve upon for four rounds of the postseason. "I grew up a Rangers fan, so I saw a lot of them," Quick said. "He was very competitive, very explosive. He competes, he battles. I just remember I was more nervous back then than I am for (Game 4)." Eighteen years later, Quick is a champion just like the goalie he idolized as a boy, but he did Richter one better by capturing the Conn Smythe Trophy as playoff MVP after the Kings eliminated the Devils with a dominating 6-1 victory in Game 6 at the Staples Center on Monday night. Quick allowed just one goal Monday night and allowed just seven goals in the six-game series. The 26-year-old Quick capped one of the greatest seasons by a goaltender in the history of the NHL. In 69 regular-season games, he went 35-21-13 -- a mark that would've been far more impressive if the Kings hadn't been the worst offensive team in the NHL for about four months -- with a 1.95 goals-against average and .929 save percentage. Quick is nominated for the Vezina Trophy, along with the Rangers' Henrik Lundqvist and Predators' Pekka Rinne. Before the Stanley Cup Playoffs got under way, Quick was playing brilliantly yet flying under the radar on the West Coast, something Drew Doughty feels could unfairly cost his goaltender a much-deserved Vezina. "He's unbelievable," Doughty said. "He's out here in the West. I think if he's in New York, where everyone is thinking Lundqvist is going to win the Vezina … If Quick is in New York, I don't think there's any doubt he's going to win it. We lost so many games by one goal and won so many games by one goal, and that was always due to his hard work and how well he was playing." For a long stretch during the regular season, the Kings' offensive inefficiency left Quick with more losses than wins on his record despite the fact he was averaging less than two goals allowed per game. On 17 occasions during the regular season, Quick allowed just one goal; his record in those games was 8-5-4. The Kings found a way to lose nine times in 17 contests where only two goals would've meant two points, something that Jarret Stoll feels could've demoralized most goaltenders, but did nothing to affect the ultra-athletic, ultra-flexible Quick. "He works so hard to find pucks," Stoll said. "Maybe you think, 'How the heck did see that puck? How did he find that thing?' He's all over the net. You watch him on replays when the iso-cam's on him and he's constantly moving and his legs are so strong. He's so flexible, so athletic that he can get into so many positions in that crease and make saves. "We've seen it time and time again where he can come up with these saves and calm our team down, keep the game 0-0, keep the game 1-0 for us, whatever the case may be. He does it game-in and game-out. That's the other thing that's surprising -- the consistency he has in his game. There's no valleys, there's no dips in his game. "He's playing on another planet." The amazing play of Quick may be news to fans who just tuned into the Cup Final or for those living on the East Coast who are unable to stay up late enough to see Kings games, but this is old hat for his teammates that see him every day. Kings forward Mike Richards was acquired before the season in a trade from the Philadelphia Flyers, an organization that has been seemingly trying to solve its goaltending issues since pucks were first invented. Like anyone living on the other side of the United States, Richards received glimpses into Quick's talent, but he never understood the full gravity of Quick's brilliance. On Feb. 14, 2011, Richards had a front-row seat to view Quick's penchant for taking over a game. The Kings beat the Flyers 1-0 in Philadelphia as Quick made 40 saves in the hostile environment of the Wells Fargo Center. "He was our MVP," Scuderi said after that game, something that never changed throughout these playoffs. 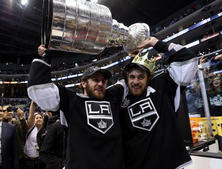 It didn't take long for Richards to appreciate Quick after arriving in Los Angeles before the season. "I think training camp for me," Richards said when asked when he realized just how good Quick can be. "I didn't get to see him very often. He had an unbelievable game against us in Philly last year, but still not knowing very much about him coming in this year and just playing against him in training camp and shooting on him every day, you're amazed at first at some of the saves he makes. You see it on TV. They're amazing. When you see so many of those saves, it's tough to be amazed anymore." Scuderi has been with the Kings since 2009, and, just like Richards, doesn't bat an eye when Quick makes one of his acrobatic saves. "It's kind of strange for us because we see him in practice every day," Scuderi said. "Just like with any great player I've been fortunate to play with, they do more great things in practice than you'd ever see in a game. It's not really a shock to any of us. It's great to see him playing so fantastic and at such a high level every night, but it's not a shock to any of us who are in the room." Quick's personality is a bit of an enigma. Ask him about himself with cameras, microphones and recorders near his face, and he deflects away the questions with the same smoothness he turned aside virtually every Devils shooter for four games. He's soft-spoken to the point where he seems shy or nervous with a crowd around him. That image in front of the media, according to his teammates, isn't indicative of who he is when he's with teammates and friends. "There's nothing too fancy to him," forward Colin Fraser said. "He's a straight shooter, a quiet guy, but not as quiet as he comes across. He's not a rah rah rah, yell-and-scream, super-intense guy." "He's awesome off the ice," Doughty said. "He likes to have fun. He fools around in practice. He likes to have guys try to score on him. He likes to laugh. He's just a great guy." Some goalies operate independent of the team. It's not that they are intentionally selfish and don't put the team first, but it takes a certain type of human being to stand alone on the ice for 60 minutes and voluntarily get in front of frozen rubber discs being fired at them. That tends to breed the occasional odd personality -- Ilya Bryzgalov is perhaps the prime example -- but Doughty offered a rare compliment regarding his goaltender's demeanor. "He's not like most goalies," Doughty said. "Most goalies are kind of weird. You kind of stay away from them. But you can talk to him about anything or approach him about anything at any time. It's awesome. "That's not really his style," Scuderi said. "He's just likes to be on one of the guys. I've played with some goalies that like to be separate and do their own thing." The humble and nimble Quick will likely be separated from everyone in the history of the NHL after his eight months of goaltending this season. "I feel like I tried to give my team a chance to win every night," Quick said. "From a goalie standpoint, that's your job. You try to do your job every night and hopefully more times than not, you can do that." Quick did just that 16 times in this year's playoffs and now can say, although he never would, that he has one more postseason trophy than his childhood hero.